Known as one of South Africa’s most critically acclaimed fiction writers as well as one of the most modest, he has never courted fame—however, now, with his name attached not only to a new novel but also to a creative writing course at a prestigious university and an award-winning play, Ivan Vladislavic is emerging, deservedly, from obscurity into the limelight. The novel is called The Distance and appears to be about the struggle of Writer, Joe Blahavic, to write an account of his obsession with Muhammad Ali, the boxer who started off as Cassius Clay, and who will always be known as ‘The Greatest’. Working from some old scrapbooks filled with newspaper clippings from the late 60s and early 70s (in South Africa, the days before TV), Joe runs into trouble and invokes the assistance of his older, more worldly-wise Video-Editor brother, Branko, to get the book written. For reasons that would spoil the reader’s enjoyment of the novel, the book of Joe is left unfinished—but the writing process unravels a myriad of tales of history, identity and belonging that bring the reader right up to the present day, when even Branko’s Millenial son inadvertently plays a part in bringing the story to not a close, but at least a full stop. As much as the novel is a fiction, it has a material basis—the scrapbooks are real; in fact, the traces of their physical existence linger in the printed book, with words, phrases, sentences lifted verbatim from the clippings and set off in a special font against the rest of the text. Vladislavić’s description of the writing process shows that his is very much an exploratory approach to mining fictional gold from the ore of the past: “I had the idea for the book in about 1999. I went to Germany on a residency for a year. I packed up my house and I suspect that I found a box of clippings, which I had been carrying around with me for many years. “The archive reflects a certain set of interests, a certain set of fascinations of an earlier self that had to be accessed, to be constructed. Once I unlocked how to do it, it wasn’t too difficult, but it took me many, many years of self-starts, I was even making notes. “The whole account of the writing of a novel, which is built into this book, is pretty accurate: first, just reading the material, reading the archive and making endless notes about that, then, finding ways of processing that or structuring it. “Initially, I was thinking of just writing a long essay about being a collector or being a fan, about hero-worshipping sportsmen, but I could never find something compelling enough for me in that small idea,” he says. Until 2015, Vladislavic made a living as a Freelance Editor, working with some of South Africa’s most celebrated writers, including Tim Couzens, Charles van Onselen, Jonny Steinberg, Antjie Krog, Chris van Wyk and Achmat Dangor, to name a few. Then two important things happened at once: he won Yale University’s Windham-Campbell Prize for short stories and he was offered a post as a Distinguished Professor in the Creative Writing Department at Wits University. Although he had already won a string of prizes, including (with David Goldblatt) the Kraszna-Krausz Award for Best Photography Book in 2011, as well as the Sunday Times Fiction Prize, the Alan Paton Award and the University of Johannesburg Prize, the Windham-Campbell Prize carried some serious financial influence. The professorship was a chance to do something entirely different: “I’ve always been doing something to earn a living, so the teaching took the place of the editing. It’s more secure and easier in some ways because as a Freelance Editor, one still doesn’t make a terribly good living. “My friends used to joke with me that if you can do two jobs, at least one of them should pay properly. Now, I’m working in a workshop system where all the students and the supervisors meet together as a group. “The responsibility is spread a little bit further, trying to help each student to write the best book they can. I think you can teach almost anybody to write better, and you can accelerate the kind of learning that writers have to go through on their own,” he says. Vladislavic has no intention of becoming any sort of guru, however. “Clearly, the thing to be resisted is, you don’t want to try to churn out replicas of any particular writer. The other thing is, you don’t want to try to get everybody to write in the same way. The trick is to actually get people to do what they’re doing more effectively or more compellingly, to try to get them to do a better version of what they want to do,” he explains. In addition to inspiring young writers in person, Vladislavic’s work has also been inspiring people in a different sphere—the stage. 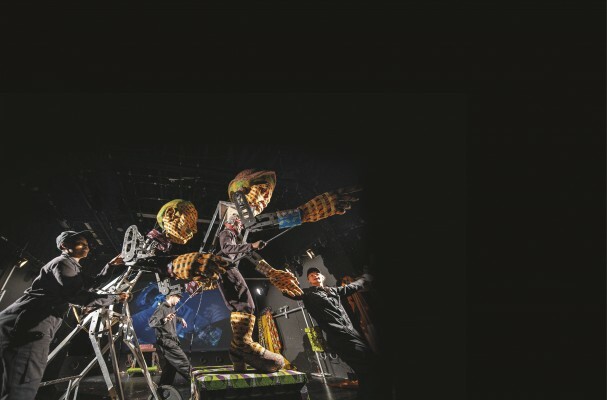 Save the Pedestals, a collaboration between the Baxter Theatre Centre, Handspring Puppet Company and Halle Puppet Theatre, had a hugely successful world premiere in Halle, Germany, last year. 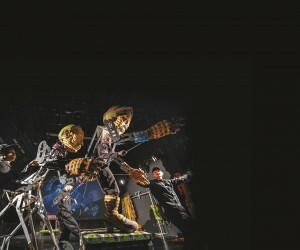 Vladislavic’s eponymous short story provides the narrative, which is brought to life by a South African creative team under the direction of Choreographer and Director, Robyn Orlin, who is widely regarded as one of South Africa’s most controversial and provocative choreographers and performance artists, and featuring puppets by the Tony-Award-winning Handspring Puppet Company, led by Adrian Kohler and Basil Jones. The puppeteers are Mmakgosi Tsogang Kgabi (Botswana and SA), Lambert Mousseka Ntumba (DRC) and Franziska Rattay, Ivana Sajevic and Nico Parisius (Halle Puppet Theatre). Described as a poetic-political discourse, the iconoclastic work sees struggle comrades Comrade A and Ma Z wandering around a Johannesburg filled with long defunct public monuments and sharing dreams and slapstick humour levelled at monuments erected to Saddam Hussein, Cecil John Rhodes and Lenin, among others. “The idea behind this production of Save the Pedestals is to bring together the best German puppet theatre with the best puppet theatre from African countries,” explains Torsten Mass, who came up with the idea for the project. “The performance has its finger on the pulse from a historical perspective and simultaneously addresses and encourages discussion around this global problem, in an interesting and provocative manner. Vladislavic’s story, at its heart, is about how we deal with monuments that have been left behind by political change and we are, therefore, resigned to confiscate them and they end up being nothing more than rubbish heaps of concrete,” he concludes. Save the Pedestals makes its African debut at the Baxter Flipside, for four performances only, from 28 to 30 March at 8pm, with a matinee on Saturday, 30 March at 4pm.